Select Premium Ingredients provide Advanced Nutritional Support for crisp, clear vision in Healthy Eyes. Vegetarian Capsules. Especially beneficial for people with family histories of eye problems. 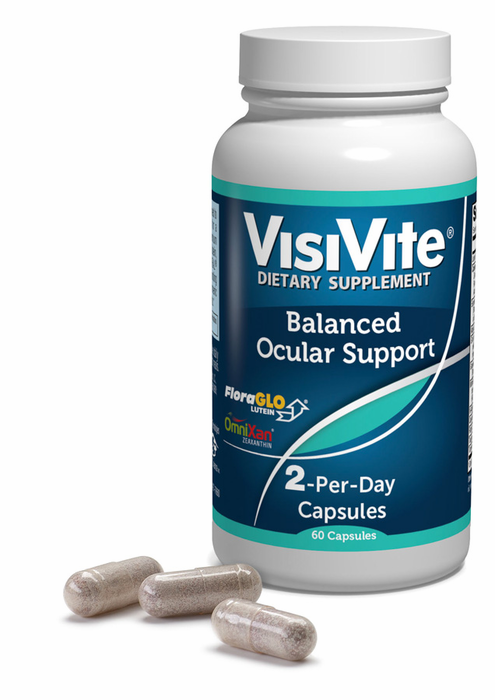 VisiVite® Balanced Ocular Support is designed to maintain sharp vision and healthy eyes for a lifetime. The foundation ingredients for VisiVite Balanced Ocular Support are the premium, natural molecules known as carotenoids, including FloraGLO Lutein, OmniXan Zeaxanthin and AstaREAL Astaxanthin, These compounds provide the yellows and reds found in flowers, vegetables and egg yolks. More importantly, the critical macular segment of the eye preferentially absorbs these colored molecules - which are visible not only in retinal photographs, but also measurements of macular pigment optical density (MPOD). Carotenoids not only act as powerful antioxidants, they also absorb blue light, thereby improving contrast. European Black Currant Extract, with Cyanidin-3-Glucosides, improve dark adaptation following bright light exposure. This not only speeds visual recovery when coming indoors, for example, following being outside at the beach. It also improves visual recovery when entering a tunnel when driving. Slowed dark adaptation is one of the hallmark findings in patients who have macular degeneration. 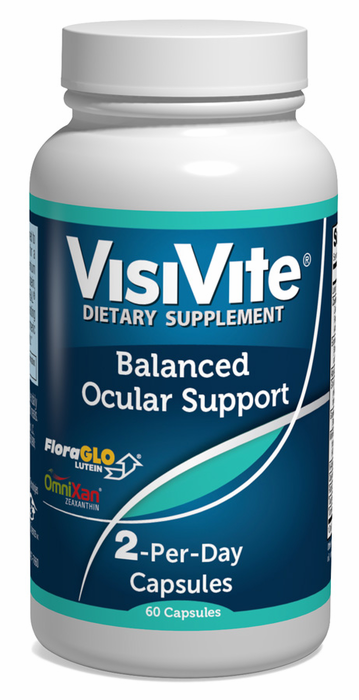 Finally, VisiVite Balanced Ocular Support adds microcirculation-boosting ginkgo biloba, inflammation-modulating turmeric and a range of protective super-antioxidants, including Grapeseed Extract, N-Acetyl Cysteine, Quercetin, Rutin, and Taurine. 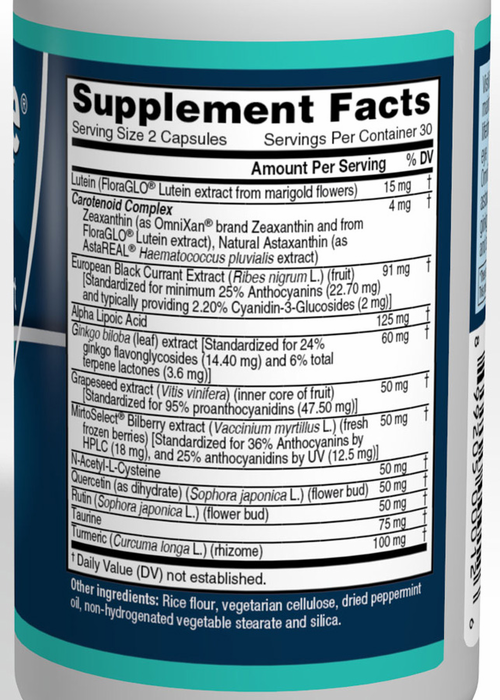 Premium carotenoid blend containing Lutein, Zeaxanthin and Astaxanthin. 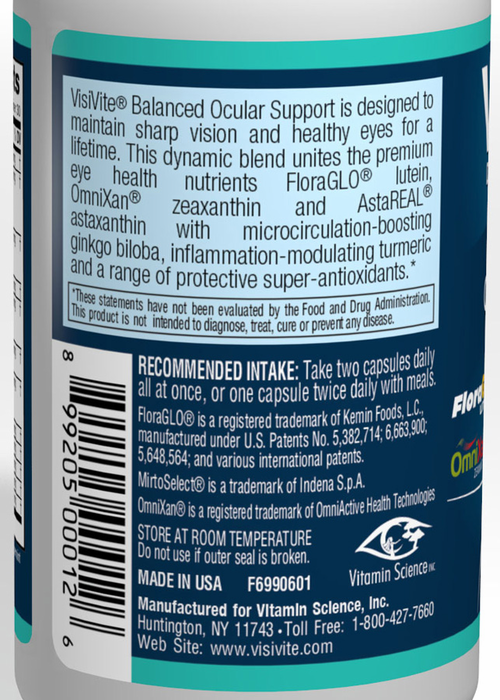 Promotes continuous healthy retinal function. Especially beneficial for those with family histories of AMD. Vegetarian capsules. Mother and father both had wet macular degeneration, so I'm trying to do what I can. I showed this to my nutritionist, and she was so impressed, she's recommending it to her other clients. I'm very faithful and take two capsules every day. I'm 62 now, and nothing happening yet, so I'm very happy. Thank you.